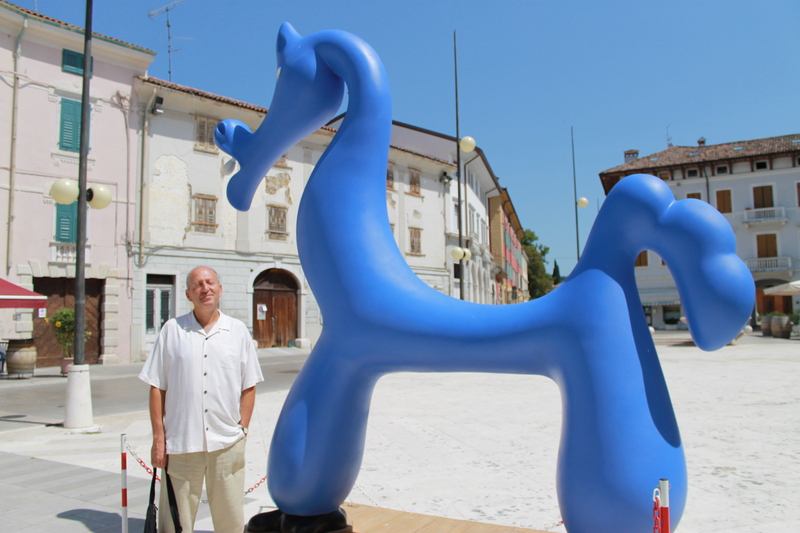 We just got back from Italy where we spent some days in Friuli, a beautiful, not-often-visited region north-east of Venice, a land of vineyards, quiet towns, delicious, fresh and imaginative cuisine, thoughtful and engrossing museums, festivals and Hapsburg elegance. The only English we heard was one English couple at a cafe; many Italians haven’t been there. Which is a pity, for it’s lovely. So if you go, stop at Cormòns and book yourself at B&B Da Sandruta. Don’t be put off by the entry, a courtyard whose major features are a woodpile and cement mixer. Go inside, where a post office once mysteriously connected to a monastery (messages from Above?) has been magically restructured by your hosts, Alessandra and Stefano, into the most comfortable secret refuge you can imagine. There’s a huge 1900 matrimonial bed from a palazzo in Trieste, stylish bathroom, fully (utterly fully) stocked kitchen, sitting room and view of your hosts’ splendid organic garden. I don’t quite get the kitchen because all around you are fine and reasonably priced restaurants. Alessandra can direct you to the best wines and wine-tastings and the breakfast, well . . .
Breakfast is served in Alessandra and Stefano’s dining room, an eclectic ensemble of period pieces and festive quirk. There’s tender whole wheat bread, made by Alessandra, a selection of her jewel-bright jams, local yogurt, butter and milk, fresh fruit, granola and espresso all served on vintage china. On our last night, told we’d have to leave at 6am, Alessandra arranged everything in our kitchen the night before, down to espresso machine ready to go on the range and the best apple cake ever baked, with instructions to take some for the road (with plastic wrap to do so). At 85 euro the night, you can’t go wrong. You can buy the finest prosciutto on the planet around the corner, and although I can’t remember the name, there’s a bar by the huge blue horse which makes terrific panini. Where else can you take lunch with view of a blue horse, and then fill your afternoon with Roman ruins, wine tasting, wandering through a palace where the last king of France breathed his last, or take in a cultural festival featuring post-modern dervish dancing under the stars?